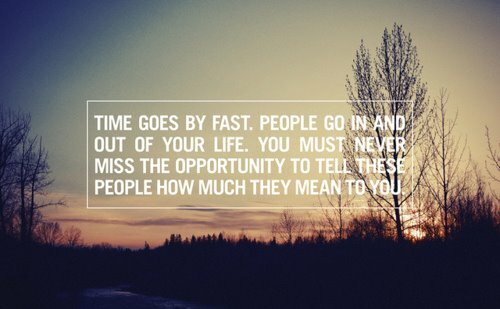 ...and it does, time moves so fast and people go in and out of your life. I wrote the other day how important it is to never miss the opportunity to tell people how much they meant to you.We always think there will be another day, another shot to see them again but there are no guarantees. Life is so fragile and it does, it goes by so fast. So for today and for each day after remember that you've just got to get out there and live, take chances, make mistakes, make wishes, be kind and tell them, tell the people you love that you love them...that they left a mark, a footprint on your soul.